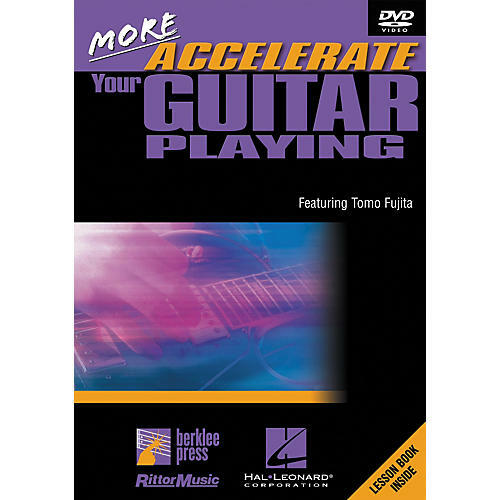 The More Accelerate Your Guitar Playing DVD offers easy-to-understand exercises and demonstrations that can be applied to all levels and styles. Clear and detailed instruction is given both onscreen and in the accompanying lesson booklet. Professor Tomo Fujita, in Elements of the Solo, shares his proven method for improving the essential skills required to play guitar with other musicians and to freely express yourself on the guitar. Professor Fujita has been teaching at Berklee College of Music since 1993 and continues to be one of the most sought-after and effective guitar and ensemble teachers. He has played guitar with the Tony Award and Pulitzer Prize winning musical Rent, and has shared the stage with notables such as Phil Collins, Roomful of Blues, and Darryl Jones and the Saturday Night Live Band, to name a few. Additionally, Tomo is the winner of Boston's Best Guitarist Competition, and he has won critical acclaim in Guitar Player and Guitar Shop magazines.